We've added a fun and rather unique spam-fighting technique to the site—a cover-based "captcha." Basically, you get a book cover, and you have to name the author of the book. Most of the time it's obvious. When it's not, you can request another cover. It's tolerant of case and punctuation. It didn't seem to be stopping spammers, and it required a separate registration for all our subdomains. It just never worked for us. The new one will, I hope, stop automatic spamming. (Maybe 1/4 of our spam isn't automated—it's people whacking away at it on keyboard in cheap-labor companies.) Unlike reCaptcha, nobody else uses it. Also, while book covers can be run though a text converter, it's not at all obvious to a computer what part of a book is the title. Humans can tell titles from authors. Not so a computer. Cool - any non English-language covers there? The "another cover" link isn't working for me. Really? Are you sure? What's your browser? Anyone else? Ah. A change I just made. Sec. I like this. Pure text captchas have reached the point where if they're hard enough to fool good text-detection algorithms, they're hard enough to stump a lot of people, too. (The "rippling flag" ones drive me bananas.) It's distinctive, non-annoying, and hopefully it should do some good. I tried the "try it out" link and got blank space where the cover should be. I'm not sure whether to be insulted or honored. Of course, you can just punt these things and let the user click "another cover" -- the vast majority work great, and it appears the chances of having two impossible ones in a row is pretty slim. Edited to make the bookcaptchaimage links not links. If you clicked them, you got binary data displayed as text, i.e. garbage. Very good. Excellent idea. Whose was it? Ok, this is weird. I edited the above message, and forgot to fix the > and < in the first snippet of html. It is now showing random covers every time I look at the message. I'll fix the html again. How the code relates to the cover you get and whether it changes isn't something I'm getting into. This is wonderful. Much easier on the eye than the normal ones, and really related to the site. I love it! I give it five stars. I have a cool related idea. But not tonight. I'm working on spam tonight. That's a really clever idea, Tim. Also, while book covers can be run though a text converter, it's not at all obvious to a computer what part of a book is the title. Humans can tell titles from authors. Not so a computer. Perhaps you should ask for the title since in many cases the author would be any words after the word 'by' in the string the text converter returns. If spammers start catching on and manage to read the text - you could get it to ask random questions about the cover: author, title - but also things like "enter the first four characters of the author name". By introducing some random-ness, it will make their trickery more difficult. Jesting aside, it's a nice idea! Clever AND fun. 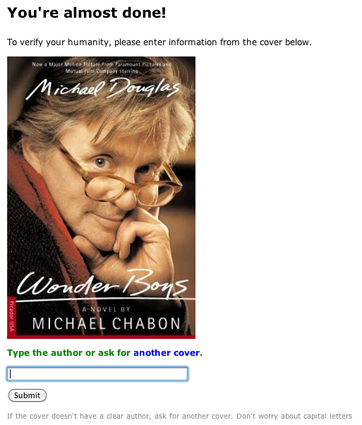 Good way to get serendipitous recommendations of books to read (or ... more devious ... publishers could pay YOU to use their books for captcha purposes). Love it. I can never figure out/see the usual captcha phrases and its just luck that I can get it right. The thing that I think is cool here is that Captchas are about making something that's easy for a human to do, but hard for a computer. Parsing text is relatively easy for a computer, but figuring out what's the author and what's the title is not. Anyone today can pick the author off a book—you know when the author name "James Paterson" is huge, because he's him, and when it's not. Obviously, if you applied lots of bookish intelligence, you could write something to get by this. But spam is a numbers game. LibraryThing is very small potatoes. Writing something to add stuff automatically via a virtual browser was easy. This would take many hours of work, and involve lots of scraping of Amazon, or something. If they attempt it, I'll just move to user-provided covers, or titles, or whatever. Okay, I just babbled to my forum-friends about this because I think it's SO COOL. That's how awesome this is. I agree with others that the Captchas and similar are waaaay too hard for normal people to read... The wavy lines, the multiple colors, it doesn't stop spammers it stops me! But I loooove this cover thing. It's a great idea! 24> Spam fighting for the win!! I LOVE a place where even anti-Spam measures can turn people on to new books. Just hope that Google Goggles doesn't open access via API. Right now I can take a picture of any book with it, and it will send me to amazon or Google Books to the correct book 99.9% of the time. One other question: accessibility. What's the option for low-sight or blind users? I like how it works, and how harmonious it is with LT.
Any idea how well this is working to deter spammers? I know we've been getting some spammers lately, but I don't have a sense of whether it's more or less, or the same. Much less. Daily spam accounts have virtually vanished. What's left are the non-automated people. They do more damage, though, per user. There's something peculiarly satisfying about flagging a spam commercial account and knowing that somewhere in the background it's being dealt with. It's a good way of handling the problem. I tried it and the first two covers I got had no author, but it worked for the third one! This had been in the back of my head for a while... it was the cover tagging game, wasn't it? Or is there something else??? This is just great! I just love the amount of creativity and cleverness you guys have! 38> WTH? Did we really just get drive-by spammed on the thread about spam catching? I wonder, do you make money from home by spam-catching. That would be meta.